A perfect garden for your home or property is not out of your reach. With the help of our landscaping Southampton company, your property will look more beautiful than ever before. 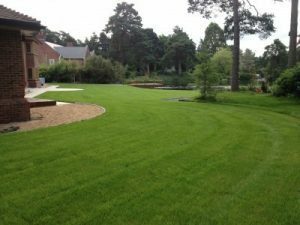 From dedicated planting schemes in the colour of your choice to hard landscaping such as a new driveway – Abbey Turf is the company for you to choose today. Call our friendly team today on 02380 812 302. At Abbey Turf, we have been designing and creating beautiful landscaping Southampton designs for several decades. Both homeowners and commercial property owners have our company as their first port of call when it comes to landscaping such is our fine reputation. Keep reading to find out more information. Soft landscaping refers to the softening of garden features with details such as plants and flowers. At Abbey Turf, we are the experts when it comes to landscaping in Southampton. We possess years of experience and the vital designer’s eye needed to fulfil the requirements of every customer. If you have always wanted a particular look for your garden, we can achieve this with dedicated planting schemes for a garden that really blossoms. Ensure that your garden looks great all year round with our regular pruning and maintenance service. It is important not to let your garden become overgrown otherwise the look that you want will be spoilt. Of course you may not have time to maintain your garden or have the skills, which is why it is important to entrust the work to our team. We will do the job properly first time round. In addition to the services mentioned above, we also provide site clearance and turf laying. We only use our own specially-grown turf, which has been carefully grown for a green and lush look that is rarely bettered. Our landscaping team are adept in laying foundations for all types of projects. To find out more, we recommend that you contact our Southampton landscaping staff today. The garden of your dreams is possible with our help. In contrast to soft landscaping, hard landscaping is when the landscape of your property is altered with permanent features. One of the most popular options is block paving which is recommended for properties where easy access is required. The look is one that will never date and in the event that it should get damaged, we can repair it very easily. Gravel drives are equally popular with many of our customers as they look wonderful in all types of properties. There is no need to worry about security with a gravel drive as they will help inform you of any unwanted intruders. 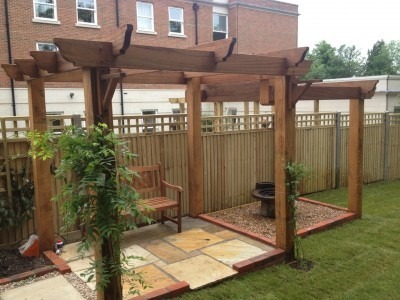 We also supply patios as part of our landscaping in Southampton service. No garden will be complete without one of our expertly crafted patios, which can be a great place to entertain friends and family during the summer. We have 25 years’ experience as the number one choice for landscaping Southampton needs across the city and county. You can count on Abbey Turf to deliver a service that is impeccable at all times. We are a family-run company that is dedicated to providing you with an unbeatable service as we care about our customers and our reputation. By selecting our Southampton landscaping business, you can relax knowing that all of our services are fully insured in the event of unforeseeable accidents. We are highly skilled and knowledgeable in all areas of landscaping in Southampton. No job will be too big or small for our team, nor will it be too wild or average. Your wish is our command as we will do our best to make sure that the design is tailored to your property’s needs. From design to construction, we will take care of your landscaping in Southampton requirements from start to finish. We advise you to get in touch today to find out more about our services and how we can help you. Did we mention that we offer a free no obligation quote for all potential customers? Don’t miss out on yours today! Call Abbey Turf today on 02380 812 302 for an excellent landscaping Southampton service.